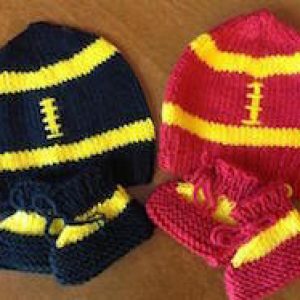 Join us in our tradition of donating Hawkeye and Cyclone themed hats, booties, and bedding to Iowa NICUs. Items will be donated during the week prior to first Iowa Hawkeye home game of 2019. This donation is a particular favorite of our volunteers, nursing staff and of course the families! The nurses look forward to this donation so they can deck out the warmer beds, isolettes, cribs, and babies out in Hawkeye and Cyclone gear for the NICU families! Simply use any pattern to knit or crochet Hawkeye Black and Gold and Cyclone Cardinal and Gold themed hats and booties. Please closely follow our volunteer measurement guide when making your items. Make sure that hats are not too long or too short. If you are making a set of hat and booties, be sure they are in the same size range. We need about 2/3 of the items to be Hawkeye themed and 1/3 to be Cyclone themed. Please visit the Volunteer Information section of our website for more crafting information. You can read all about how to sew NICU bedding on our website. The first home Hawkeye football game is August 31, 2019. We would like all hats to be tiny heads and bedding on the beds for the first Iowa Wave of the season. This donation will be made to the hospitals we support on or around August 26, 2019.